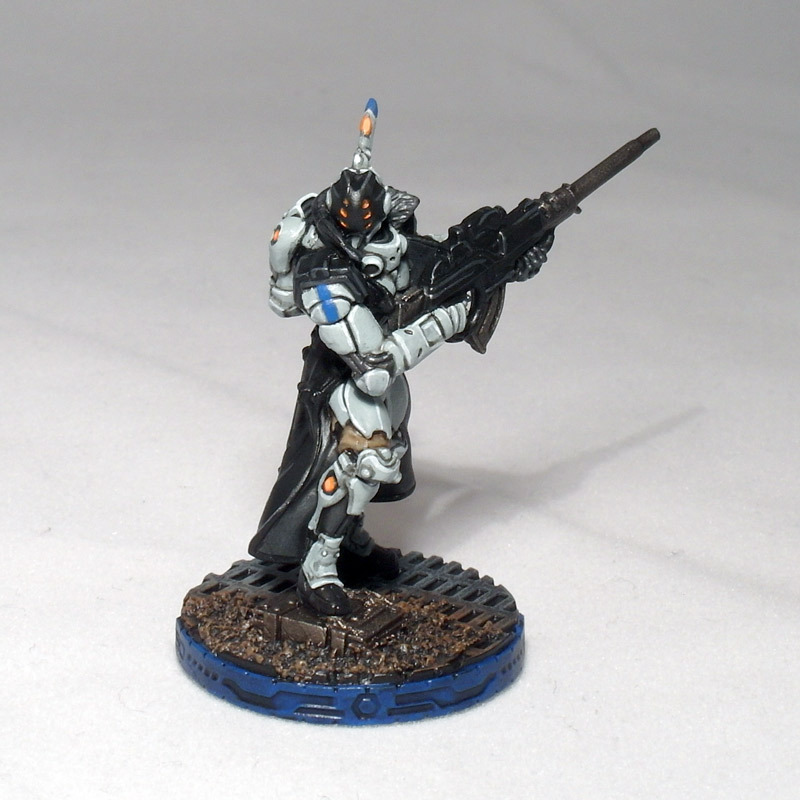 Although I’ve not played Infinity in quite a while, I’ve certainly been painting it! Below are a few shots of a group of models I painted up for a friend. 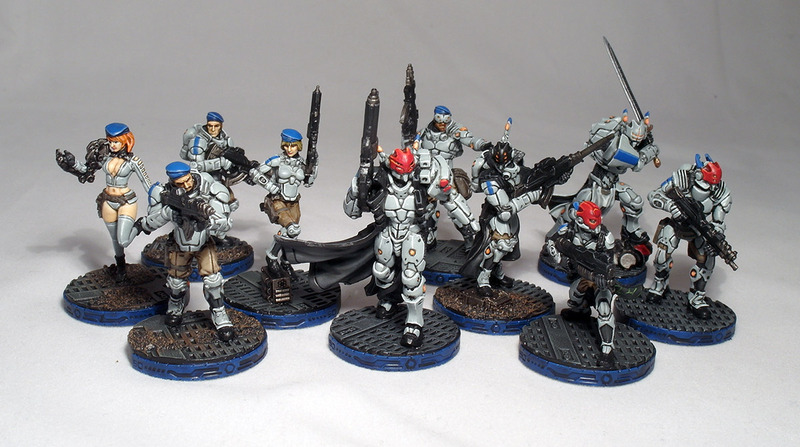 They share a very similar scheme to my Yu Jing, which I’ve been slowly painting over the past year or so. 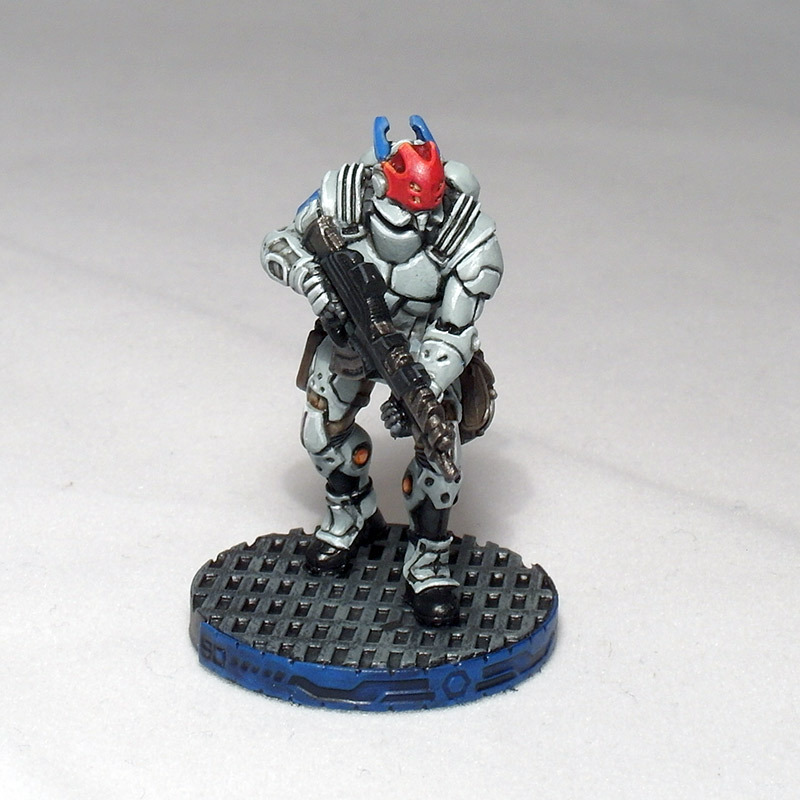 Where they differ from my Yu Jing is in the spot colours. For the PanO – after some discussion with my friend – we chose blue and orange as spot colours. Certainly different enough to differentiate the two colour schemes, we felt. The models were painted up using Celestra Grey, washed with Nuln Oil then highlighted back up with Celestra Grey and Ceramite White on the edges. The blue areas were painted with a Cote D’Arms blue (which I forget the name of), then washed with Drakenhof Nightshade, before being highlighted with Calgar Blue. The orange ‘lights’ were painted with Trollslayer Orange which was washed with Reikland Fleshshade, then given an additional highlight of a 60/40 Ceramite White/Trollslayer Orange mix. Any cloth areas were painted with Karak Stone and washed with Agrax Earthshade. I do enjoy getting stuck into an Infinity model, since I can spend a lot more time on them than I would on a model from a board game (which I’ve been painting a lot of recently!). The first models I did from this set were the Fusiliers. 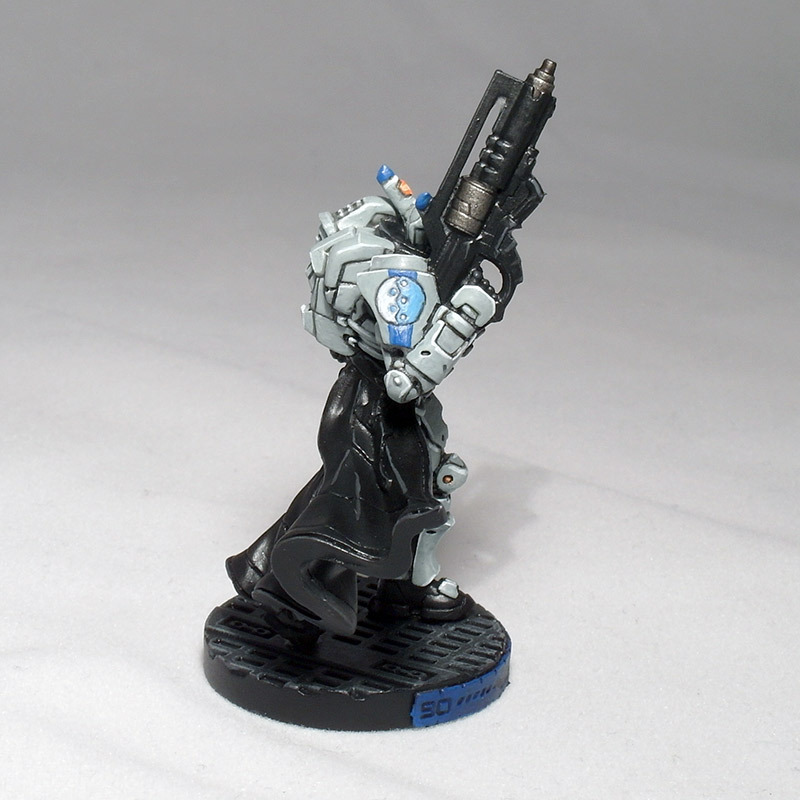 The model with his weapon pointing down is the third iteration of this model I’ve painted now, so he served as the test-bed for this colour scheme. I added the blue vertical stripe to his right shoulder pad at the request of my friend – this is the unifying feature of the colour scheme, as other parts of the models will feature sectorial colours depending on which part of the PanO list they come from. Next up was the Bolt – not a huge departure from the Fusiliers – just a few more armour plates and a helmet this time. 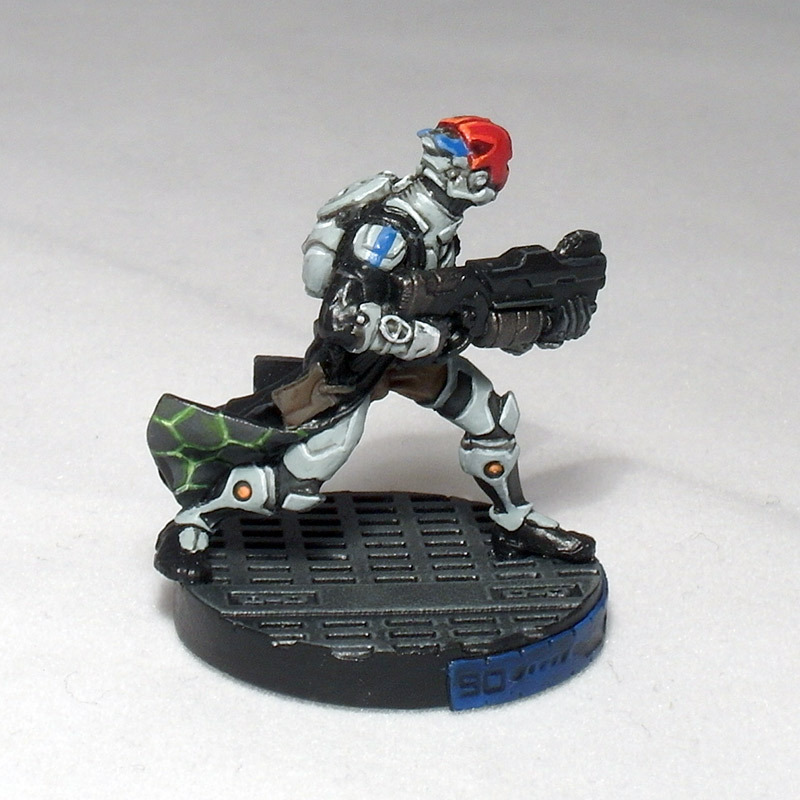 The faceplate of the helmet was painted in the Neoterra Sectorial colour, much like the studio PanOceania models, and this theme will carry through other sectorial models. 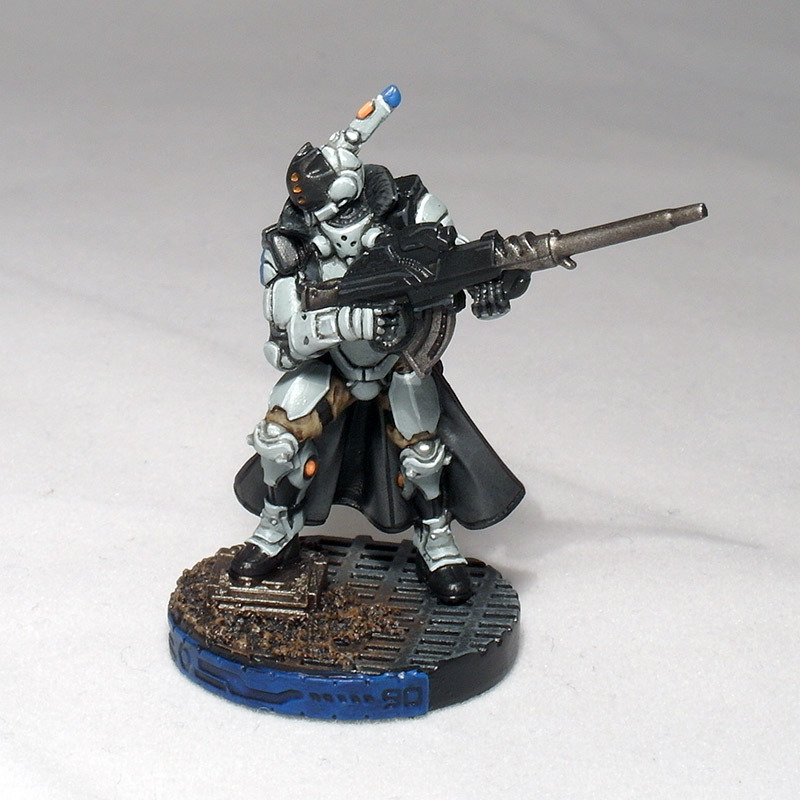 Following the Bolt was the other Medium Infantry model in this group, the Nisse Sniper. I kept his coat very dark. The outside was painted with Abaddon Black, while the inside was done by washing a very dark grey undercoat with a couple of coats of Nuln Oil. Similar to the Bolt, the sectorial colour of black was added to his faceplate. 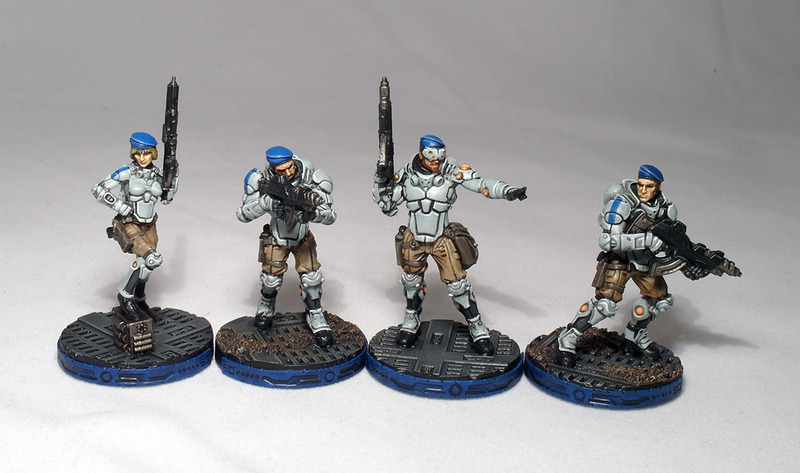 Returning to Light Infantry, I picked up the Hexa next. Like the Nisse, I washed the interior of his coat with two coats of Nuln Oil. However, because of the high-tech nature of the Thermo-Optic Camo, I wanted to try to add a glow effect to the recesses, which I think came out quite well. I saved the bigger Heavy Infantry models in this batch until last, viewing them as a bit of a treat. For the Father Knight, I wanted to make sure his white robes stood out a little from the off-white armour, which I hope I achieved. 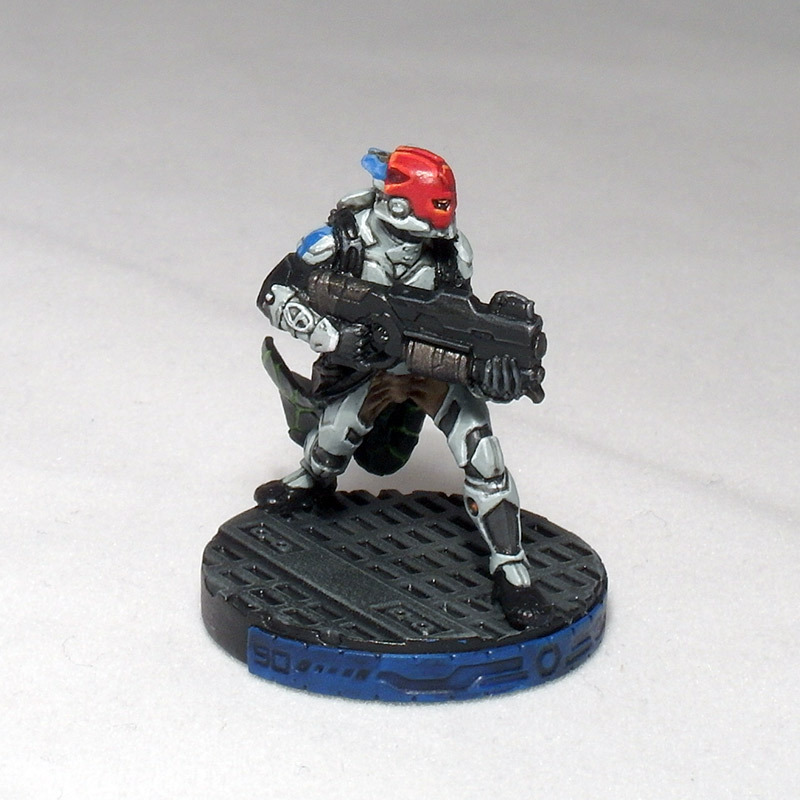 I was also keen to add a little friendly jibe at one of our other friends who plays Infinity, by painted the wrecked piece of Gecko TAG on the base in his colours of red and black diamonds! Finally for this batch of models, I painted up the Aquila Guard. 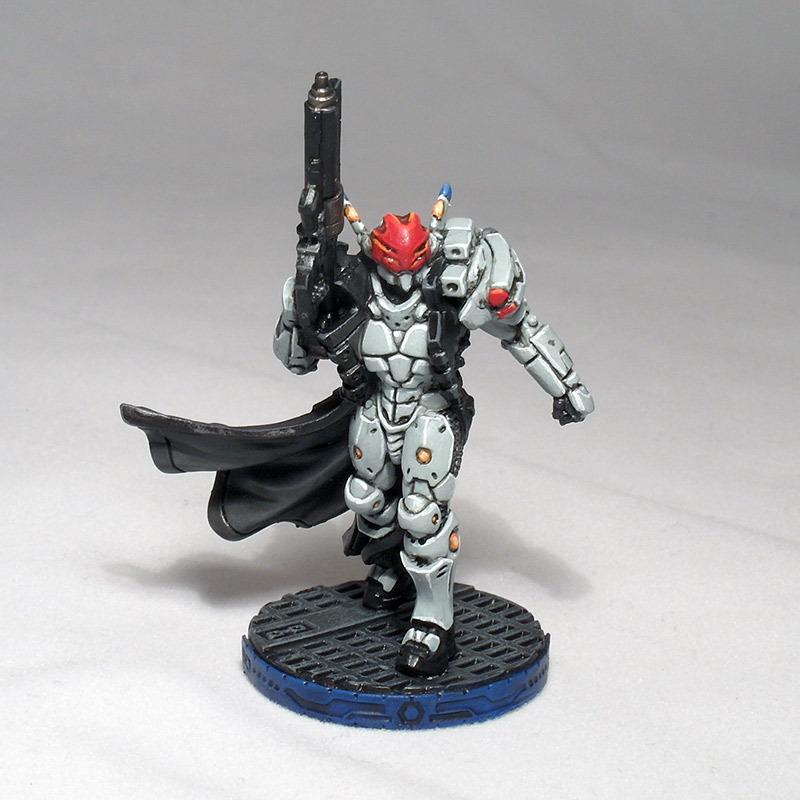 Back when I was first starting Infinity this guy was a mainstay of my lists – and the resculpted version of the classic looks even better, as well as being as good in game as he was back then! Like the Nisse and Hexa before him, his coat was painted black on the outside and a (heavily washed) grey on the inside. Like other units from Neoterra, his faceplate was painted red. For the bases, I simply washed the grey undercoat with Nuln Oil, then drybrushed them Mechanicus Standard Grey, Dawnstone then Celestra Grey. 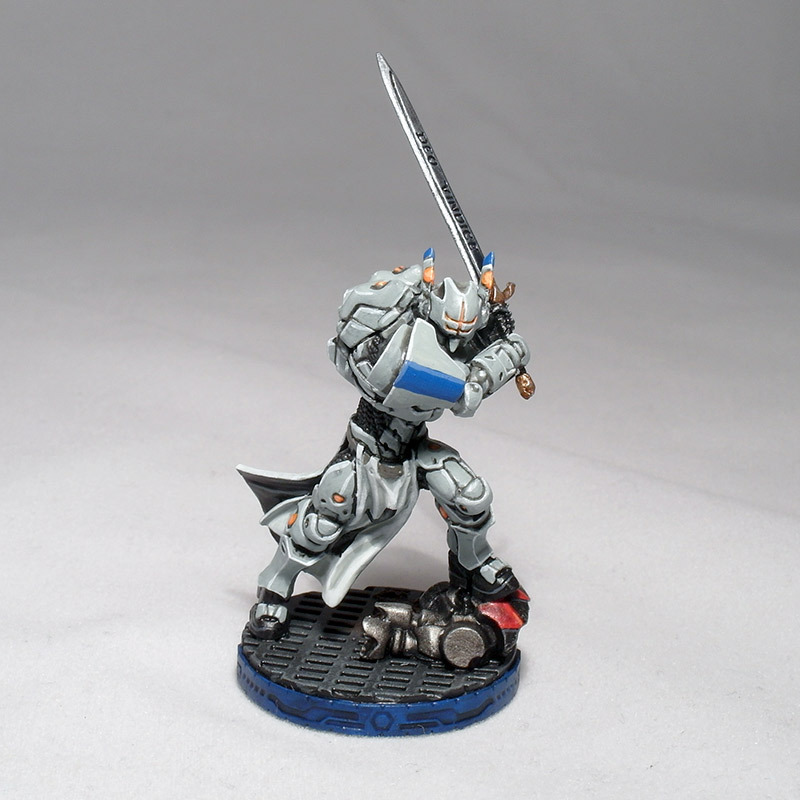 The patches of dirt were drybrushed with Mounfang Brown, then Steel Legion Drab. I really enjoyed getting back into painting some Infinity models, and I hope to finish off my particular pile of them as the year progresses. Who knows, I may even play the game again this year at some point! Next We’ve started a podcast!